Yes, I’m jumping on the bandwagon. The green one. My friend Kris told me about this class at the Hoover Library on How to Make a Rain Barrel. During the class, you were given all the supplies and actually came home with one. $30 for a rain barrel isn’t a bad price I didn’t think. So, here I am, going green. Good for you! I’ve been trying to talk your dad into one of those for years! That’s awesome! I think that was a great price, too. That’s what has always held me back from getting one-they’re expensive! In Colorado it is illegal to capture water on your property unless you own the water rights. Who knows the owner of water rights on our property! 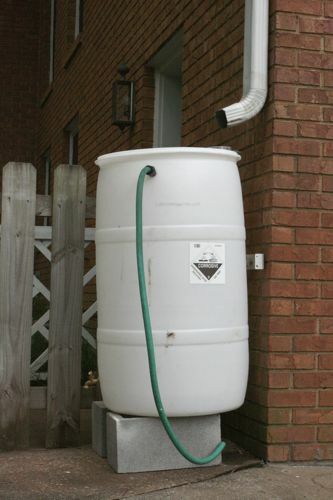 Janie thought I was crazy when I told her that in some places rain barrels are illegal. Many places depend on the storm water to augment their treatment facilities collection. If you keep the rain yourself you’re robbing the public utilities, you thief! That’s not why it’s illegal in CO I bet. They have some weird riparian laws since they don’t get much precip. Combined systems (storm + sewer) are really BAD news, and are extremely outdated. Sewer treatment is NOT augmented by storm water by law. Okay, so I looked up the word “riparian”. Now my previous comment looks stupid.